Seeing Team Gotham‘s Solo for the first time immediately draws comparisons to Legend of Zelda: The Wind Waker. Reading about it however, made it seem more like Undertale, if the player was romantically involved with the antagonist. Except that in Solo, there’s no combat. At all. While kind of nice, this felt surprising coming from an exclusively male dev team. The idea certainly caught my attention. When I was invited to the GDC Mix party, I knew I’d have to talk it over with the game’s Art Director and Game Designer, Juan de la Torre. Despite loving the original concept, I was a bit skeptical going in. An game about love after heart-break could turn toxic if done through the lens of stereotypical gamer culture. The concept alone could turn some players off. Who wants to relive situations where their love life may have seemed gross or creepy from the outside? Unbeknownst to me, Team Gotham’s Solo is actually inspired by de la Torre’s own experience. It was he that went through a bad breakup and came up with the idea for the game. De la Torre came off as a very respectful, thoughtful individual, and his experiences mirrored my own in some surprising ways. The game is called Solo, but it’s all about relationships. While that may seem a bit confusing, Solo is a game not just about love, but meditating on its meaning. Alone. By yourself. In the safety of the game world. Part of the reason for this is because, culturally, some of us are taught not to talk about these things. I don’t just mean men, but people who don’t align with traditional gender roles or who’s relationships are more complex than “I’m attracted to the opposite gender.” Regardless of your experience Solo’s story still manages to resonate with the player. Relationships (and the feelings behind them) are quite difficult. Sometimes they can threaten our gender image and, depending on your age and region, maybe even your physical health. This really struck me because it’s something I’ve actually been struggling with for a long time. Games that allow the exploration of these kinds of themes without explicitly restricting themselves to a specific audience make them feel safe. De la Torre said that Team Gotham actually got help from an LGBTQ group in Madrid, Spain called COGAM to help the devs properly respect a spectrum of people. I don’t just mean with character models, but also opinions, questions about love, identity, and how those might reflect on or emanate from one’s partner. See, while the game is played alone, Solo gives you a theoretical representation of your partner. 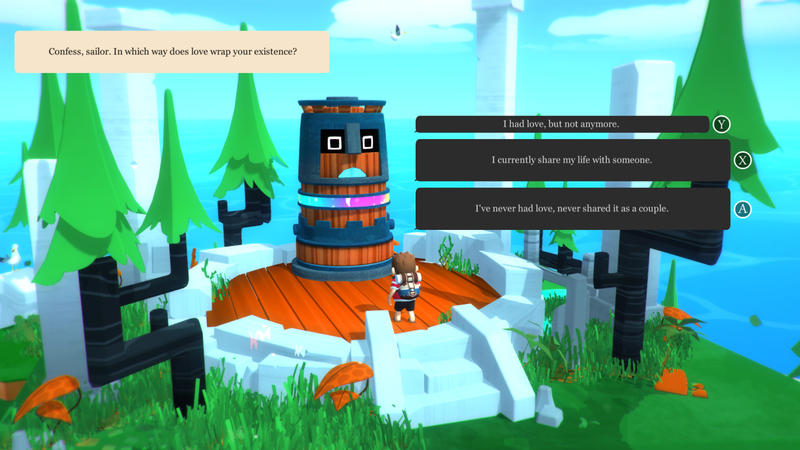 One which will react and adapt to the player based on how the player responds to questions posed by the game. As you play, the questions about love adapt to players’ responses changing the narrative. This wasn’t always the case though. Initially, Team Gotham had player choices change the game world as well. Playtesting these small changes initially made the game feel a bit judgey. For example, if someone was alright with polygamous relationships, the game’s weather would change to rain. I thought this was appropriate: water is a symbol of change, even renewal, but it can also be seen as dark and gloomy. A perfect summary for a lifestyle that isn’t well tolerated in the west. However, the devs worried that a player might feel judged for this. The rain could be interpreted as it being bad decision, so this feature got the axe. Judging goes against the very nature of Solo. 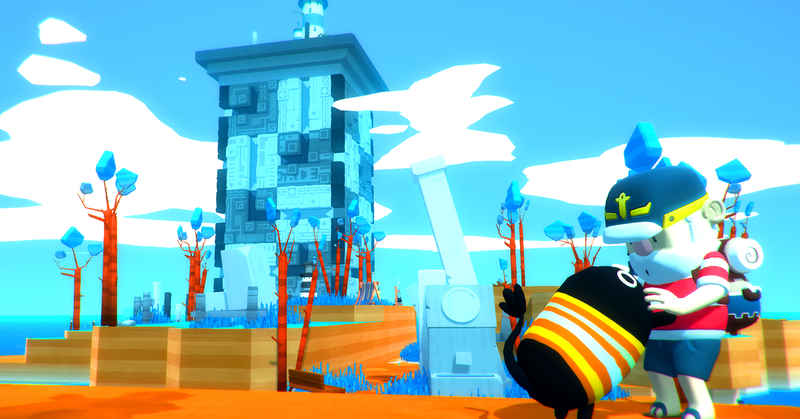 The game meant to be a safe place where the player can consider questions and perspectives beyond their comfort zone. Especially in cultures where sharing certain feelings or perspectives is frowned upon. The dialogue and narration are just ideas the devs tossed around and later refined with help from members of the community. What I saw was both thoughtful and insightful. For example, if a player chooses that they could love other people, a shadow of your chosen partner appears and says, “Does that mean it’s OK for me to do the same?” It’s something I’ve known several people found out the hard way. People whose partners felt they were allowed to explore, not something they “allowed” their own partner to participate in. Despite being a game by guys, I think it is important to have a safe space where people can see that one-sided freedom in a relationship is, well, unfair. Hearing that from a friend doesn’t always go well, even if you begrudgingly end up agreeing. Having it come from a game is easier to take in because you don’t have to apologize to the game for getting defensive or saying/thinking something that, in retrospect, might have been childish. It’s this easy access to a safe environment that makes Solo work. 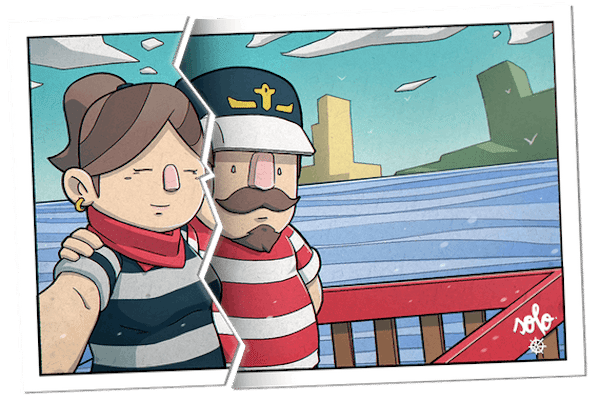 You solve puzzles, not just to make the game a game, but to remember that life isn’t easy, and sometimes you need to work to get what you want. 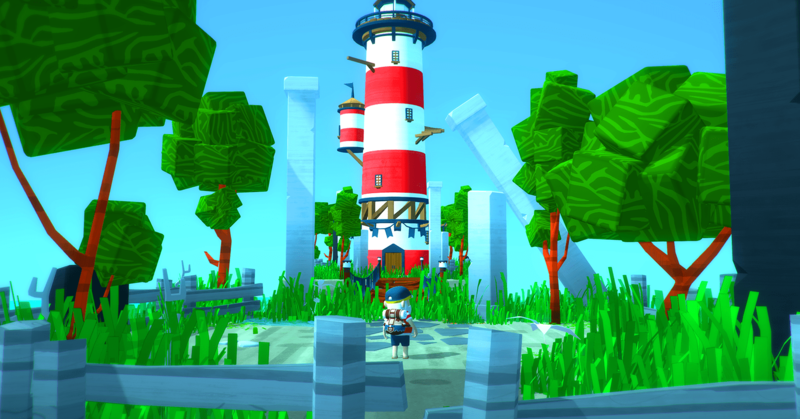 Basic gameplay is moving from zone to zone, lighting up lighthouses to awaken totems that will ask you some big questions about love and your relationship(s). A few puzzles felt a little hard, but I was also thrown into the demo with other people wanting me to finish so they could give it a whirl. It’s not all dialogue options and box puzzles though. 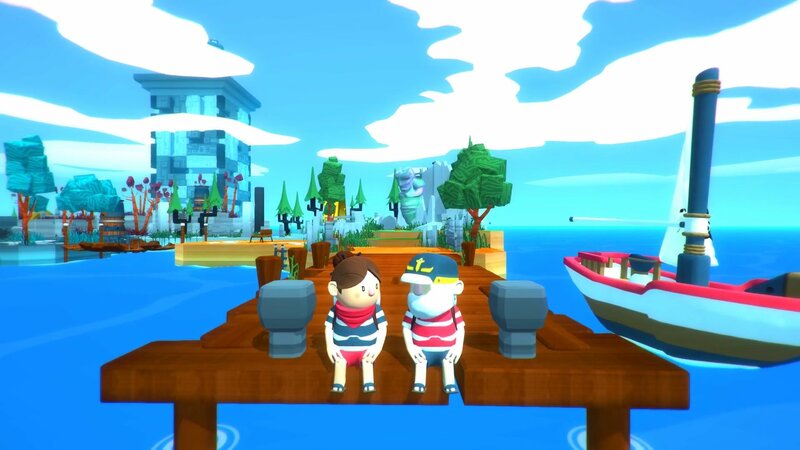 You can just sit on a bench, take selfies, pet animals to make them your friends, or talk to people. It feels like a game even non-gamers could try. Perhaps that is what made Team Gotham’s Solo feel so unique. While I was at GDC, I also got to try Knuckle Sandwich, another Earthbound/Mother inspired game. I am even hungrier for it now than I was before. I also had a good laugh with dystopian Yuppie Psycho, and I’m curious to see more about All I’ve Got is Time, which also has players stop to consider their own actions. While they all looked interesting, what I saw with Solo felt personal. It was the pacifist route of Undertale without a need for the question of violence. De la Torre admits that it may be a cry-inducing game, but hopefully, one that brings tears of joy, instead of sadness. Laguna Levine is the illegitimate son of famous explorer Toma Levine, disowned for forsaking the family tradition of moustaches to join Team Beards. That's fine though, since both are translated into the same word in Japan, Laguna's current home country.